Mer Mediterranee Egypte Port D'Alexandrie. This is a rare French nautical chart or map of Alexandria, Egypt dating to 1867 (updated to 1882). Prepared by the French Depot des Cartes et Plans de la Marine, this map offers extraordinary detail both inland and at sea. 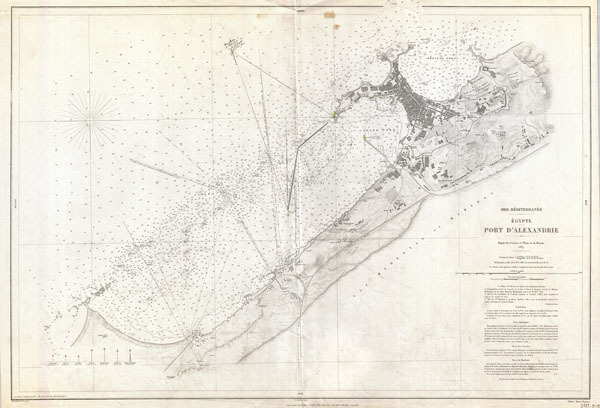 In the harbor there are countless depth soundings in meters, sailing notations, and references to shoals, lights, and navigational points. Inland there is a wealth of information regarding the city proper, important buildings, topography, gardens, streets, palaces, walled fortifications, and surrounding villages. Detailed textual sailing instructions in the lower right quadrant. Very good. Original centefold. This chart has been used for actual navigation and does have a few pencil marks which can be removed upon request. Blank on verso.